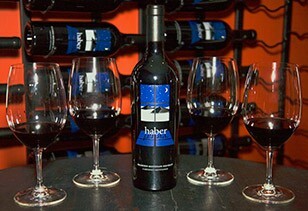 Haber Family Vineyards, which sits high atop Howell Mountain, near the village of Angwin, was founded in 2004 by Ron and Sue Marie Haber, a couple of summer refugees from the East Coast. My blogging friend Melissa Dobson, of Melissa Dobson PR & Marketing, was kind enough to arrange a bloggers tasting day up on the mountain. Sue Marie and Ron were gracious and welcoming, and the usual suspects (Randy, Michael, Marcy, and Ashley) made our way out of the Napa Valley for an unforgettable experience. The estate on Howell Mountain is a lean 5.5 acres, which was painstakingly developed 1 acre at a time due to local zoning laws at the time. My personal opinion is that slow and steady wins the race however, and this turned out to be worth the slow development. The Howell Mountain AVA was the first sub-appellation in Napa Valley to be officially recognized, and is known for it’s Cabernets. The rocky red volcanic soil sits above the valley fog, which creates long mellow growing days. The estate vineyard is between 1550 and 1650 ft, which is smack dab in the middle of the Howell Mountain vertical AVA. While the fruit grew, and the estate developed, the 2006 Diamond Mountain District Cabernet Sauvignon was released earlier this year . This bottle was decanted the night before our visit, and it was simply stunning. Those of you who know me well know that I don’t like the typical overblown overdone overextracted Napa Cab, and this wine was the elegant, silky antithesis of that. I tasted chocolate, smoke and salami in the wine. Or was that the nibbles I was chowing down? Sue Marie put on an amazing spread for us. The wine continued with pepper and subtle blackberry, with juicy plum notes. As the wine opened up further in the glass, and as we ate lunch and drank more, the rich mocha flavors came out to play and evergreen notes teased me. At one point I had an overwhelming aroma of Earl Grey tea, which was followed by fig, black cherry and root beer. I really enjoyed this wine, and for $80 it is worth it. I would certainly buy another bottle to hold for a special (or not so special) wine drinking occasion. If you have an opportunity, try to catch Sue Marie and Ron while they are in town and make it a point to taste their beautiful wine. The Howell Mountain Estate Cabernet will be released next year, and I look forward to going back and tasting that offering as well.